A patient survey helped a seriously ill patient with a secondary complication that would have otherwise gone undetected. I am sharing a patient experience from a friend of mine, with her permission of course. Last week Wednesday this friend had her gallbladder removed, and was home by Thursday resting comfortably. On Monday evening she started experiencing significant abdominal pain in the area of her incision. By 10 p.m., she presented to the ED and was admitted overnight for observation, got very little sleep, and was still in a lot of pain in the morning. To put it bluntly, she was miserable. My friend is like many of our patients; limited medical background, not sure if she should speak up, and too afraid to speak up. Trusting her medical team, she assumed there was nothing more to be done for her pain. That all changed for her around 9 a.m. when she received a text message from our electronic patient survey application. Within five minutes, her nurse came in to see what was going on. After explaining the amount of pain she was still in, even with morphine, the nurse took action. Within 30 minutes, the general surgeon came to see her and ordered a pain pump. Her pain was now controlled - that’s great! However, due to the inexplicable amount of pain and some imaging results, the surgeon felt it necessary to perform surgery. By her estimate, she was being rolled down for surgery around 11 a.m., only two hours after the survey! During surgery, they found a bleed by her liver presumed to be a result of the previous surgery. The bleed was repaired and she was resting comfortably in her room by 3 p.m. I saw her last night and she was in good spirits. I think a lot of us in IT ask ourselves "How do I impact patient care?" Here is a perfect example. The IS Department, more specifically the Project Team, gave my friend a voice. She didn’t know what was wrong, but she knew she was in a lot of pain, and something had to change. The survey was a tool for her to express concerns where she otherwise felt too timid verbalize. This survey also started a chain of communication that led to emergency surgery. Who knows, maybe the survey saved her life. But at the very least, it saved the day. Please keep this patient experience in mind during your next project. While we don’t always get to see it, our work in the IS Department has a direct impact on patient care and makes a significant difference. – Cliff Searl is clinical informatics consultant at Agnesian HealthCare. 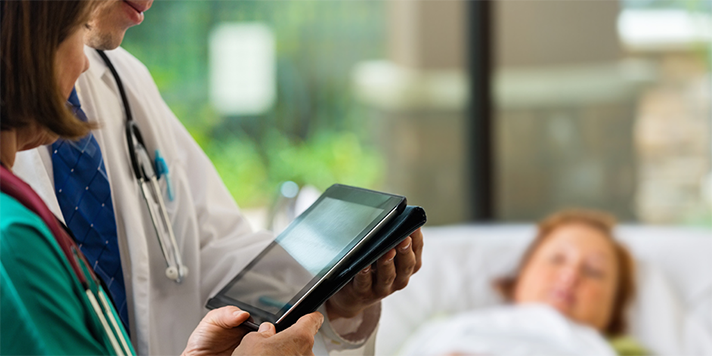 This National Health IT Week, HIMSS is giving the industry a platform to share stories about how health IT is progressing. We are at a critical point on the path to healthcare transformation in the U.S. and policymakers want to know if we are making progress. Share your story and help impact policymakers. What does 'patient engagement' really mean?